Two of our best friends, Charlie & Amanda, had their baby on Sunday! 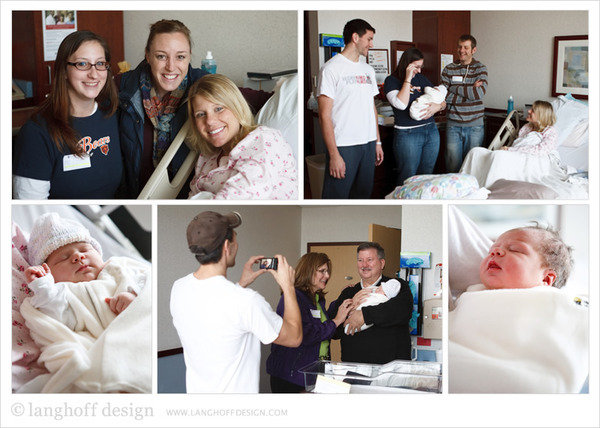 They welcomed little Kaylee Ann Staniger into their family at 1:10am on 11/13/11. She weighs 8lbs 4oz and is 19 inches long. Her fingers and toes are very long and she has lots of dark brown hair. She's quite the little sleeper...so far anyway. Precious! Chad and I were so excited to get the opportunity to spend some time with them in the hospital just 11 hours after Kaylee was born. Amanda was doing very well and Charlie couldn't stop talking about how proud of his wife he was (especially for her 20 hours of laboring). They are both so thrilled. We enjoyed their recap of the experience, complete with the "It's a girl!" shout by the nurse and the first sound of Kaylee's cry in detail. Although exhausted, they couldn't keep from smiling the whole time we were there. Amanda & Charlie are the first of our closest friends to have a child...it's so surreal! I still remember meeting Amanda for the first time 9 years ago when we were moving into our freshman dorm room. It's amazing how time flies by and how many adventures we each have undertaken since then... college memories, dates, graduation, jobs, apartment sharing, weddings, maternity, and now a baby.